Replace that worn out top end with the S&S 74" top end replacement kit. 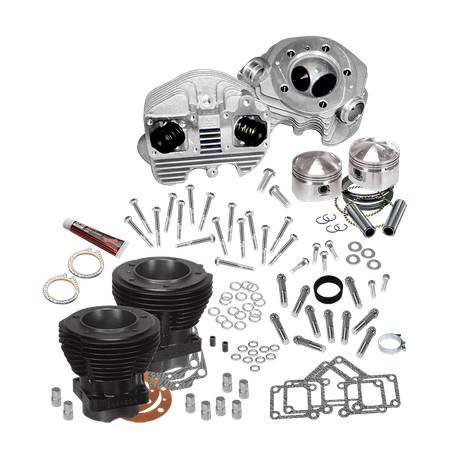 This kit contains S&S 3-7/16" bore high tensile cast iron cylinders, 3-7/16" bore forged pistons, S&S Super Stock cylinder heads, and all the gaskets and hardware needed to totally replace the top end of a tired 74" shovelhead engine. The high flowing ports and .590" lift capacity of the cylinder heads allow for improved performance and easy high lift camshaft intallation. The moderate 8:1 compression rato allows your engine run well on readily available premium pump gas. 74" engines have a stroke of 331/32", and 80" shovelhead engines have a 4¼" stroke, but the cylinder length for both engines is the same. The 74" piston is taller than the 80" piston; piston deck heights of the two pistons are designed for the same piston to head clearance in both engines. While it is possible to install an 80" top end on a 74" engine, this will result in very low compression and poor performance. A 74" top end will bolt to an 80" crankcase, but, the pistons will contact the cylinder head due to the combination of the taller 74" pistons and the longer stroke of the 80" flywheels. Therefore, it is important to correctly identify the stroke of the engine before ordering a top end kit.